Shockwave has been used in treating various tendinopathies since the 1990s, however, there has been extensive research and technology has undergone various developmental changes. There are 2 types of shockwave therapy available. Radial shockwave therapy and focussed shockwave therapy. 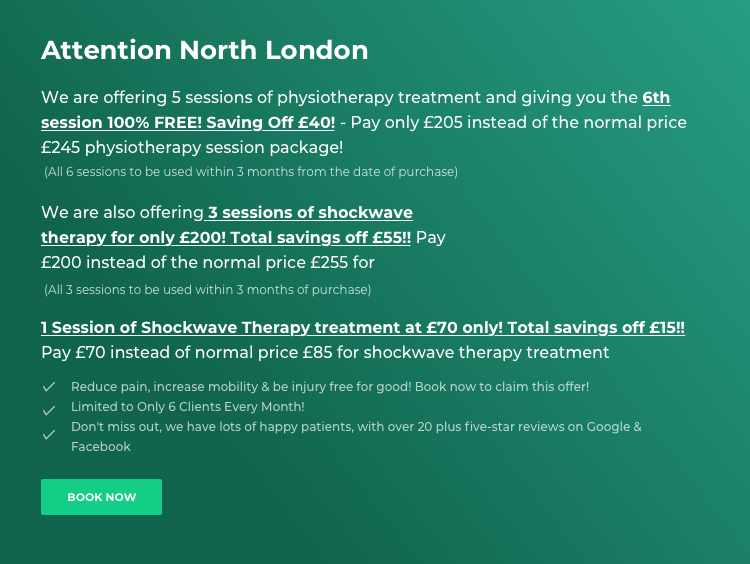 At Southgate Physio we use Radial shockwave therapy treatment. It is a high- energy sound wave NO RADIATION. The sound wave is delivered to the tissue via a probe, the strong compressor generates air pressure of up to 60 miles and hits the metal probe, transmitting the energy to the applied tissue. The maximum effect is on the skin and disperses 3-4 cms in the tissue with radial Shockwave Therapy. When the sound energy is delivered to the tissue, it stimulates the pro-inflammatory response and stimulates Healing, the osteoblasts/fibroblast stimulation and neo-angiogenesis. Therefore, taking tissues from chronic state to an acute state. It helps break down the calcium deposits by cavitation effect. It facilitates the Rehabilitation progression by pain reduction. However, it is not a substitute for the rehabilitation itself. 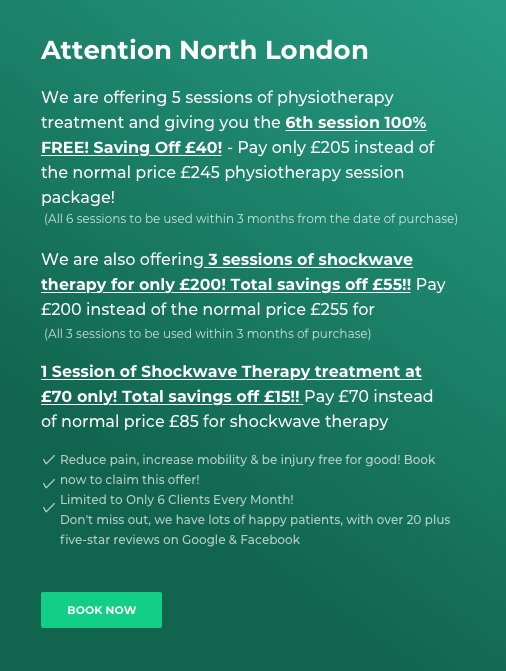 So, we at Southgate Physio focus on regular Physiotherapy rehabilitation along with Shockwave therapy treatment. Usually, 3 to 5 sessions of treatment are required. One to two weeks apart. Patients are advised to avoid using anti-inflammatory medicines, gels and icing the area after the treatment. Patient needs to stay away from strenuous physical activities during the period of receiving the treatment, however, to continue with low impact close chain exercises and loading. 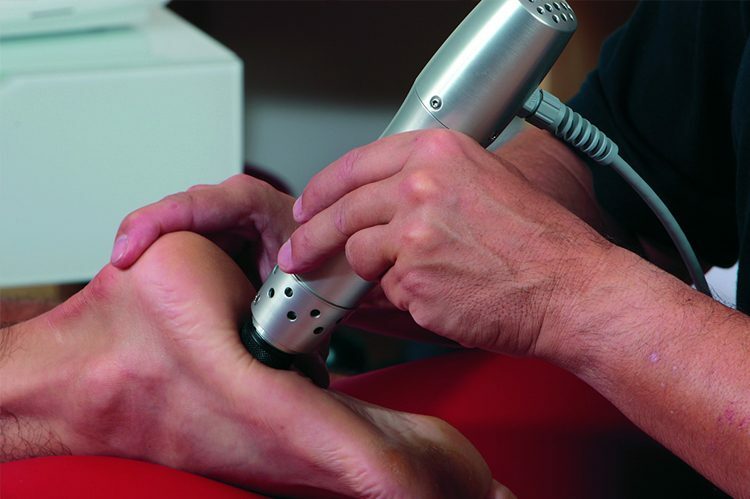 What Conditions Does Shockwave Therapy Work the Best? NICE guidelines (National Institute for Health and Social Care Excellence) and FDA has approved Shockwave therapy treatment for the following musculoskeletal conditions. The improvements in the symptoms are more noticeable after 12 weeks of the treatment and rehabilitation. However, long term benefits occur with the combination of Rehabilitation and Shockwave therapy together. 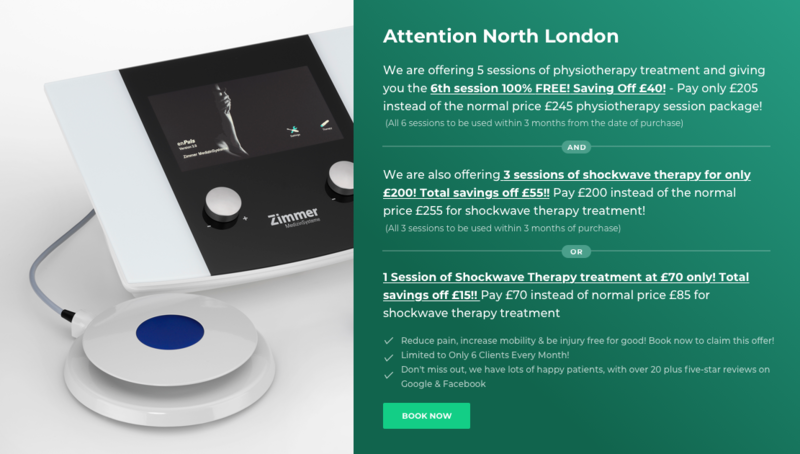 To book a Shockwave therapy session, simply contact us or give one of our Physiotherapists a call on 02083686767.